What if President Trump Called for International Day of Prayer for a Peaceful Resolution to the North Korean Missile Crisis? Imagine the leaders of the world being asked to call their nations to pray for this!! Imagine God answering this international day of prayer in such a way that world leaders see massive prayer as another option in solving world problems besides diplomacy, sanctions or military intervention! 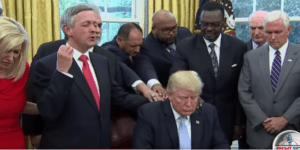 President Trump recently signed a National Day of Prayer for the victims of Hurricane Harvey. President Trump is bold enough to do what no world leader has ever done: make a global appeal to the leaders of every nation to call their nations to prayer for this missile crisis to end peacefully! Pray that some Chrisitan leaders can suggest this to him! Some are trying right now.